Celebrate Teen Read Week, a national youth literacy initiative that encourages teens to be regular library users and readers. Teens are invited to participate in Teen Hangout, Teen Gaming, or Teen Advisory Board meeting at several locations. 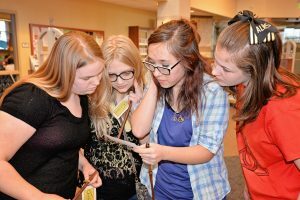 Visit omahalibrary.org for the full schedule of teen events Oct. 8-14, as well as other OPL events. Check out a list of books for teens in OPL's collection created by our teen library staff! Set aside time each day for the family to read. Give books or magazine subscriptions to your teen as a gift or reward. Share your favorite book with your teen. Host a book discussion group. Build an in-home library (thrift stores and yard sales offer an inexpensive way to do that). Create a cozy reading corner somewhere in your home. Use meal time to talk about books that you’re reading. For more information about Teen Read Week, visit www.ala.org/teenread, or get involved in the conversation through social media using #TRW17.